Numbers of Britain’s fastest-declining mammal are on the rise at Quinag in Assynt. Researchers from Aberdeen University found that water vole numbers are increasing at the site, despite a decline of the mammals across the UK. Water vole monitoring started at the John Muir Trust property in 1987. This year, researchers found the third highest annual occupancy of mammals at the site. The species is classed as priority by the Government under the UK Biodiversity Action Plan. 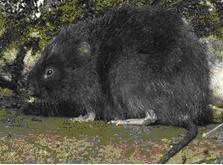 Loss of habitat and predators such as the American Mink has led to a 96 percent decrease in water voles since 1950. Sightings of the shy creatures are rare and monitoring takes place where there are signs of activity. Burrows and droppings are monitored to check for water vole presence to help glean detailed information on the species.